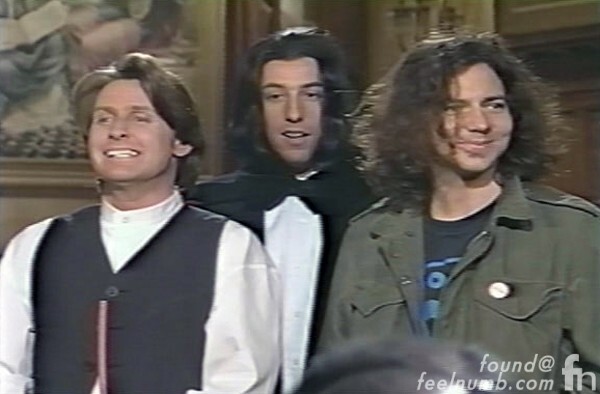 On April 16, 1994, 11 days after Kurt Cobain’s suicide, Pearl Jam were the musical guest on Saturday Night Live, hosted by Emilio Estevez where they performed three songs “Not for You”, “Rearviewmirror” and “Daughter”. 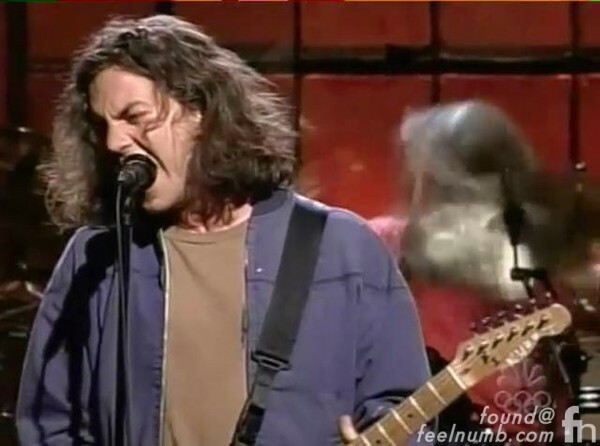 During the emotional performances Eddie Vedder wore a shirt with a “K” written on his t-shirt that was not visible on camera while they performed and ended the song “Daughter” by quoting Neil Young’s “Hey Hey, My My (Into the Black),” which includes the lyric “it’s better to burn out than to fade away” that was included in Cobain’s suicide note. The “K” was finally made visible during the SNL goodbyes when Vedder standing next to host Estevez opened up his jacket and exposed the sharpied “K” over his heart..
UPDATE: Thanks to a feelnumb.com reader who noticed another subtle tribute Vedder made to Cobain that night. 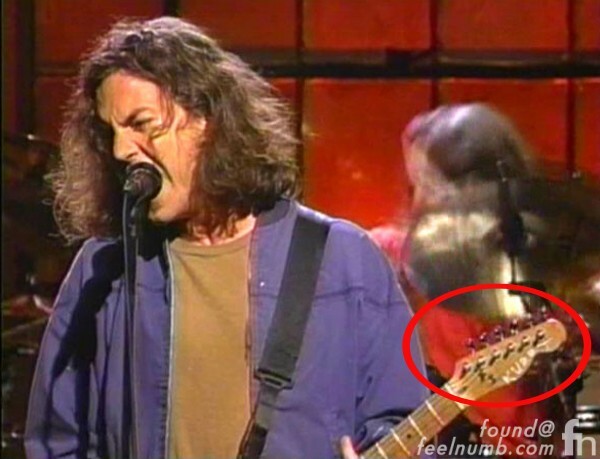 Look at the photo below and you can see Vedder wrote KURDT (one of the many ways Cobain spelled his first name) on the headstock of his Black Fender Telecaster guitar. The ironic thing was Cobain had previously professed how he hated Pearl Jam. Apparently, Cobain even wrote FUHGAWZ & FOOGAYZEE on his shoes to make fun of Vedder whom he made up with shortly before his death. Click link of photo below to find out why??? 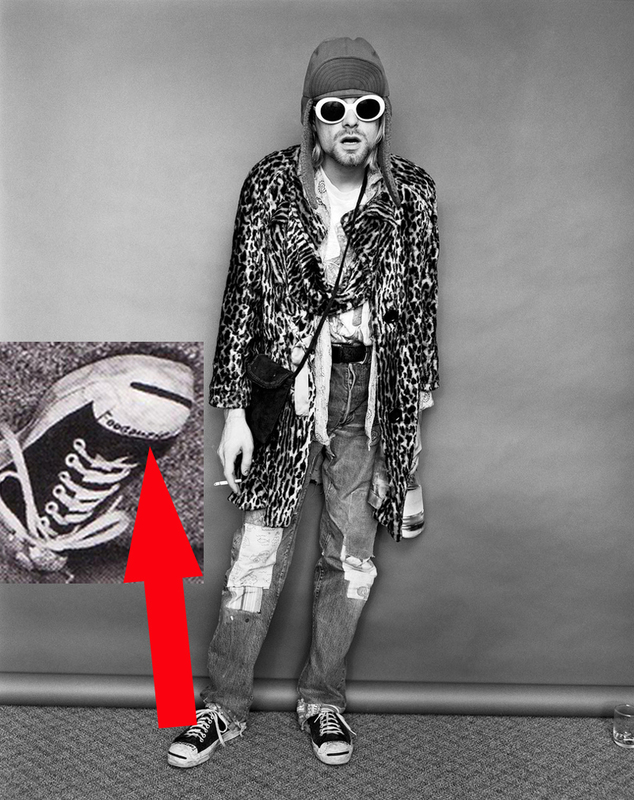 Why Did Kurt Cobain Wrote FUHGAWZ On His Shoe??? This is not entirely accurate-at more than one point Kurt had made desparaging remarks about Eddie Vedder and Pearl Jam, but in the year before his death had softened his stance, saying he wouldn’t say bad things about them anymore because they were good guys and he didn’t want to say hurtful things about people he liked. He enjoyed the members and Eddie's voice, just not the music as a whole.